A rainy, wet start to the week, but with a spot of sunshine mid‑day, a lunch out with the workers and some good stuff happening. In an effort to REALLY finalize the gelcoat we had Yando, Ben and Pla working on the aft‑aft deck. 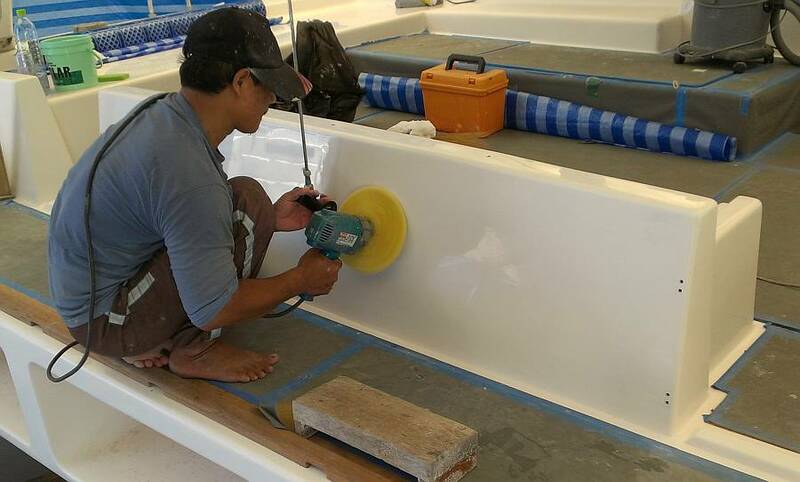 The areas around the aft deck lazarettes were never properly sanded, so Ben and Yando spent the day on that area, and got all the way up to 2000 grit sandpaper. Polishing soon? Pla worked on spiffing up the aft cockpit seats. 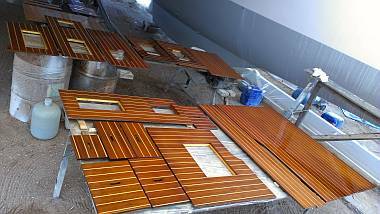 The hatch covers have already been polished, but the surrounding frames haven't, so it's now in the works. A bit of a set‑back on gelcoat, though, when Pla uncovered the vinyl on the port cockpit bench seat. There is a banana‑sized area where the gelcoat chips off. Grrrrr. We so thought we were past all that. Ok. We can deal with it. 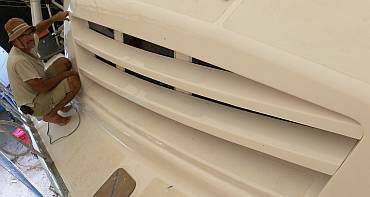 Some scraping, sanding, putting down a better filler, keeping it clean, clean, and then a small spray repair. Thank goodness we still have some gelcoat left over! 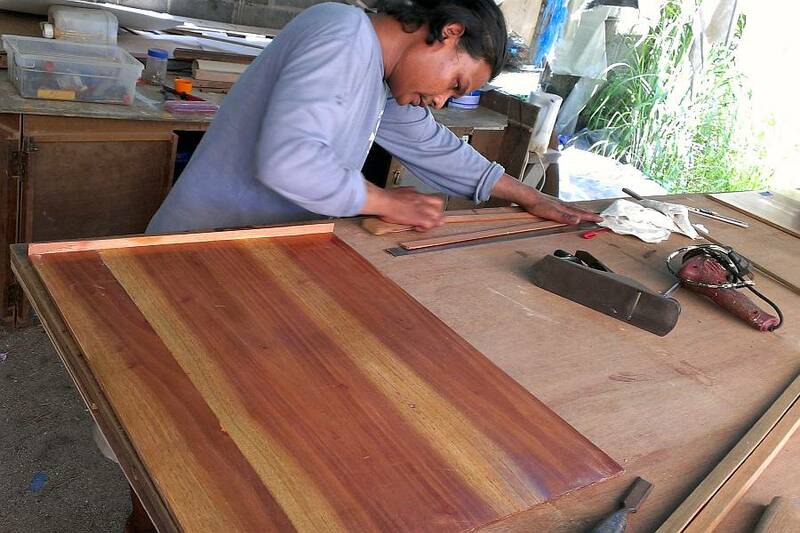 The new job of the week involves our beautiful teak and holly floorboards. Sue led an expedition to the store room and the men brought back 12 floor pieces from the salon to add to the cabin and passageway floors. When Baw first joined us almost 2 years ago, his first job was to strip the floorboards and put on polyurethane, topped with satin varnish. This is not what we want, as we prefer all polyurethane for its hardness and resistance to scratching underfoot. So Baw, Chambron and Heru sanded the floorboards back to polyurethane, and once they are ready, they'll all get 3 coats of gloss polyurethane before a final spray with satin polyurethane. Sue and Jon's morning project was to get the bimini bolted into place. First Jon measured the depth of each bolt hole (there are 24 bolts and 3 sizes needed) and then scootered to the local hardware store to get the correct lengths. 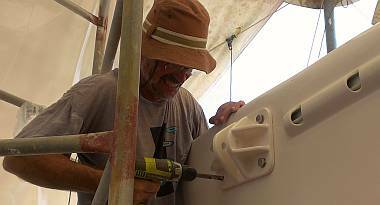 Holes were drilled through both the bimini and the targa‑bar, then they were tapped for 10mm bolts, and the bimini (only) was drilled out to 10mm clearance. 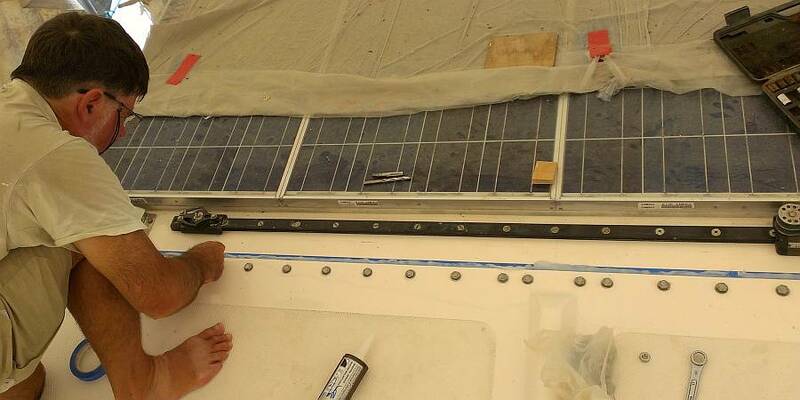 Two long bolts were put in loosely for positioning and the back of the bimini was raised up about 1" (25mm) and held up with blocks so we could clean both the underside of the bimini and the top of the targa‑bar. Marine silicone was gunned onto the targa‑bar and the bimini was lowered down. A bit more silicone was shot into the holes and then the bolts were run in and tightened. The final step was to run lock‑nuts onto the bolts (inside the targa‑bar) but that required Sue holding the bolts up top while Jon tightened them down below, and it took a bit longer than we'd planned. Our motley crew, having fun with LOTS of good food! Much to our dismay, noon arrived while we were still working and the men began scootering off to parts unknown for their lunch, seemingly oblivious to our well publicized plan to all go out for a celebratory lunch. We'd put considerable effort into the lunch already, ordering all the food and putting down a big deposit. Sue did her worry-wart thing, trying not to obsess over our poor hostess/chef Angie who was told to expect us right at 12:05. Sue was also worried that the guys would buy their own lunches and start eating, when we had this feast all ordered (and half paid for!) awaiting them. Dang, wouldn't you know it, the one day Sue has to be on the ground and organizing, she's up on the bimini roof with Jon bolting! Spicy seafood, Penang curry prawns, & crab cakes - Yum! With lunch now overdue, and the men scattered, Jon scootered off to try and find them. Sue stayed behind, and finally hopped on the scooter with Chambron and Yando (yes, 3 of us) and we found Jon and all the other workers at a local restaurant up the road. Sue and Jon then led a caravan of scooters back towards our apartment, to our favorite little Thai restaurant, By the Grace. Angie had set a nice table for the 11 of us (Akoosh was not here today, being off at a wedding). And the food started to arrive. Prawn cakes with sweet chili sauce, 2 whole snappers in chili sauce, jumbo prawns in Penang curry, rice, fresh sautéed mixed veggies, tom yam gai (a hot spicy soup with chicken), and seafood herbs and garlic (squid with lots of interesting veggie-like herbs). Wow! Yum! 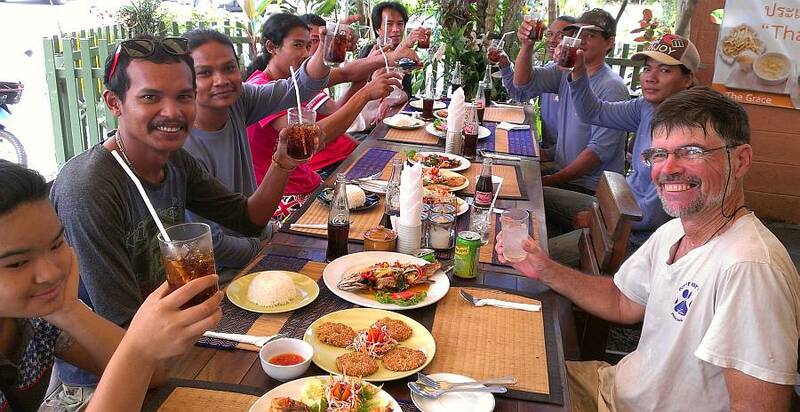 We offered the men any soft drink they wanted, but Houa spoke up and ordered Cokes for all. Probably not a bad idea as we DID need them to have energy for an afternoon of work after the big meal! Stuffed and happy, we sat out a short rain squall, then all scootered back to the yard. Houa spent time consulting with Jon about the placement of screws in the aluminum frame for the door and they concluded the bottom would get one (way inside) and then be held with Sikaflex (the brown stuff), which would also seal old screw holes where water used to enter the aluminum and the balsa‑cored boat, causing many of our problems. 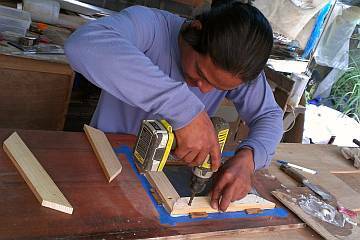 Houa's other job of the day was to make more solid‑wood frames for the hatch‑rims in the floorboards. Once we had all the floorboards out for sanding and 'varnishing" (well, applying polyurethane) we could see which needed more work. 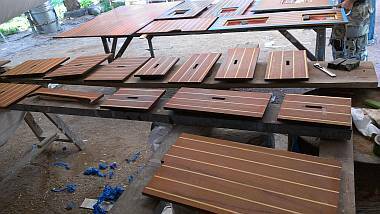 Lek got a thin strip of veneer cleaned off and put on a protective coat of epoxy, then did a final epoxy coat on the peninsula panels and the solid teak trim around the salon seats. Bo worked on both port and starboard with her cleaning rags and sponges. Jon and Sue's afternoon project was to mount the 2 starboard louvers that cover the (newly polished) starboard salon windows (the portside louvers can't go on until the 2 portside windows are put back). Sue cleaned up the undersides where there was sticky gelcoat overspray. Jon cleaned out the bolt holes, using 2 different taps to be sure the threads were in good shape. We did a test run, putting the louvers in place and making sure the bolts went in OK, which showed that it wasn't going to be a piece of cake. The bottom louver definitely had twisting issues or something, as we struggled to get those bolts to line up. Not a fun job for Jon, contorted inside the boat. Anyway, all cleaned and checked, Jon squirted clear silicone onto the ends and bolt holes, and after a sweaty 30 minutes or so he had them bolted in securely. Yay! Hello bits of Ocelot! We see you now! We had a minor tent failure during one of our many rainstorms today. All 8 of the tent legs are lashed to big water‑barrels, to help hold them down, but the back 4 have been raised up about 1' (30cm) so we can get the bimini under the tent A‑frames, and one of them fell off its perch. So we took one of the tall supports from the paint spray‑tent, brought it over to the offending pole, and Jon borrowed a 3‑ton chain‑hoist from the yard. A bit of rope‑work to attach the chain‑hoist and we hoisted the pole back up and replaced its supports, with firm instructions not to do that again! But the really unfortunate event of the day is that Sue was working on top of the salon when she dropped our HTC‑One smart‑phone (which has the camera that takes all these photos). It skittered down to the deck, flipped over the toe‑rail, and landed on the sand, 15' (4m) below. It was wearing an armored plastic cover, but somewhere along the line something smacked the screen, which spidered badly. <sigh> It still works, but we're not sure for how long. Anyone know if these screens are replaceable? Tuesday, Bloody Tuesday. It started out poorly and only got worse. It was a very humid day, and had rained all night, so when Sue arrived at the yard at 8:00 the teak and holly floorboards that had sat under Ocelot all night were actually dark with water absorption, even though no rain had hit them. Since the sun was out, Sue suggested to Baw that the boards be put in the sun to dry out thoroughly before they were sanded anymore, or, heaven forbid, epoxied. Well, try as she might, she couldn't get the idea across, and Baw couldn't or didn't want to understand. He showed us a floor piece that had been epoxied yesterday, even though it had been raining and said, "You see? Fine, Madam." So, what happened to all the concerns about epoxying in the rain? Out the window, it seems. Now it's all "No promplem." Well, putting epoxy on darkened, obviously moist wood is not on but she figured by the time they were ready it would be late morning anyway, so probably all okay. Changing the subject, Sue asked about maybe having only 1‑2 men on the floorboards, and other men working on the spars, so that we can get the mast painted. She tried to explain that we need the mast painted and rigged 1 month before we go in the water. Then there was talk of too many jobs not finished. That there were 3 men finishing the gelcoat, and more on the floorboards, and we can't have so many things not finished. Sue said, "It's always been like that, but we need the mast painted soon." Well, then Baw said he couldn't paint the mast because he had to finish the anchor support first, and she said, "Fine! Good idea!" But then Baw said he was going to finish the gelcoat by polishing under the bridge deck. Exasperation hit, as Sue tried to explain that we don't want the bridge‑deck polished (again) until just before we go in the water. When it was clear that there was no communication, Sue left for the store‑room. We'd like to prepare to raise the forebeam, and to do so we need to mount the 2 end brackets but as of now the jar with the 8 monster bolts in it has gone walkabout. Sue spent an hour in the store room hunting. She easily located the bolts that hold the anchor support to the forebeam, but that's only part of what we need. Our detailed inventory lists have broken down, once again. So frustrating. 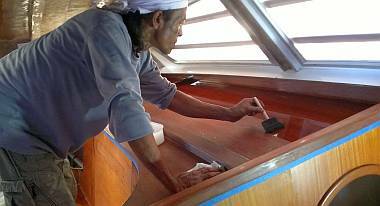 Up in Ocelot, Lek sanded the salon seat trim epoxy from yesterday but didn't get much of the peninsula done before lunch. Bo continued her slow cleaning of the lockers and bilges. Down in his workshop Houa fitted more hatch supports on floorboards and began the repair of the hanging locker shelves. On the aft deck we had Pla, Ben and Yando sanding with 2000 grit paper, the finest they use before the machine polishing. Pla did a few dit‑dot repairs as needed and those were ready for sanding after lunch. The best work of the day was by Jon, the bright spot of the day in his bright orange T‑shirt. 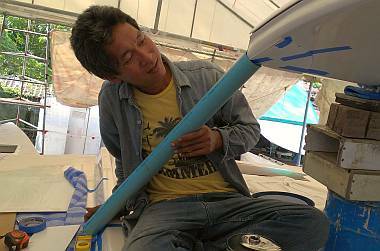 We've asked that Mike and the AME stainless steel guys come to Ocelot soon to design the forward supports for the bimini. Of major concern is that we don't build stainless steel legs in such a way that the winch handles can't turn. So, we retrieved the Andersen ST52 main‑sheet winch from the store room and Jon pulled it partially apart. He gave it a thorough service, cleaning and greasing it while Sue cleaned up all the bolts. These Andersen winches are remarkable. 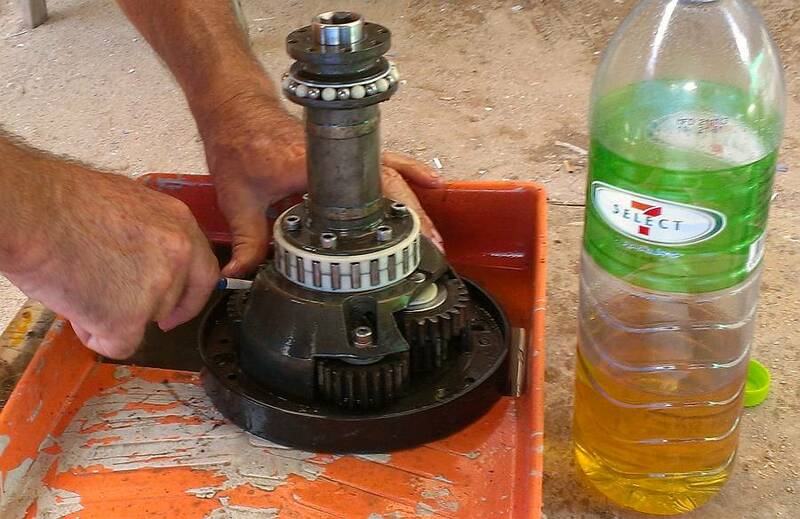 Other brands of winches say they should be cleaned and serviced every few months. Jon services our Andersen winches every 5 years, whether they need it or not (and they generally don't). 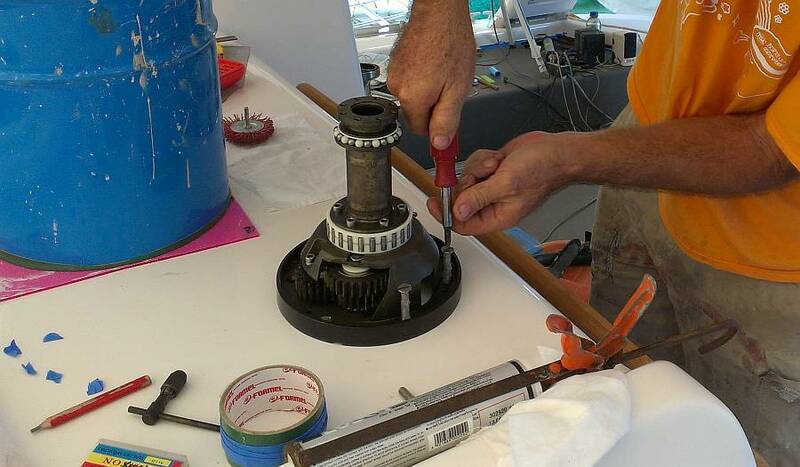 The 6 bolt‑holes for the winches had been de‑cored and filled with epoxy months ago, and now Jon had to drill through this epoxy to mount the winch onto the cabin‑top. We only had one minor set-back before lunch, when Jon drilled a hole he didn't mean to (his geometry brain went sideways for a second) but luckily it was under the winch and we could fill it with epoxy. No worries. We headed off to our beach‑side "picnic" spot for lunch, both fell asleep in our chairs, and returned to the boat at 1:25 to find Pla on deck, holding up 2 fingers. "Two people," he said, gesturing around the boat. It was true, things were pretty quiet and the scooters were mostly gone. "What?" "Go home," he said. "Everyone went home?" He raised 2 fingers again and gestured inside. Apparently he and Bo were the only 2 workers still on Ocelot. We found Cris, the yard manager, in his office and told him we'd been abandoned. He called Baw, who said he had an abscess. OK, fair enough. Baw didn't feel well so he went home. But the other 4 workers (Chambron and Akoosh never arrived)? And Lek, who works for Cris, not directly for us? And Houa? Cris said the same thing has happened to him. We decided that Baw wasn't taking a very good leader role, or maybe too much of a leader role. The men had work to do and didn't really need either us or Baw to oversee it, and Lek has been working alone for weeks, inside the salon, without significant direction from Baw at all. Jon wonders if Baw told them to go home. But that brings up nasty repercussions. Baw has worked for us since March 2012 and has been our de‑facto leader (and most concerned worker) for the last year. We'd hate to lose him, but if he's suddenly going against us we're not sure what to do. All we can figure is there was a loss of face involved in the morning's discussions and miscommunications. But mutiny by the whole team seems a bit much. Figuring there was nothing more to be done, we carried on with our own tasks. 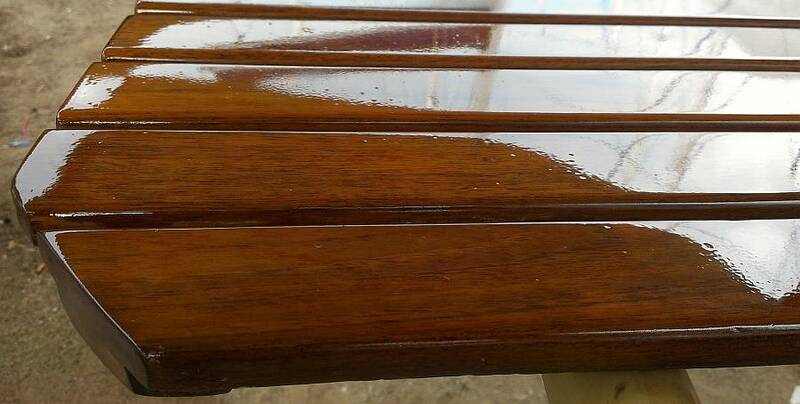 Pla polished the whole aft cockpit seat and the newly repaired swim ladder grooves on both sugar‑scoops. Sue tried to hurry Bo along in her cleaning, and assigned her some new areas up in the salon so we could watch her. Sue got about 95% of the silicone out of the port window, getting herself covered in black "feathers" in the process. Houa did return. He was not part of the mass exodus, but had gone off to his child's school for something. But he did request a half day on Ocelot so he could work on the rounded locker door (on his time) and a woodworking project for Swiss friends of ours. The best success story of the day was that Jon got the winch mounted and assembled. So now, at least on the port side of the cockpit, we are looking a bit more like a sailboat! Yay! We are now decompressing at home, wondering what to do about this worker situation. Feeling hamstrung and held to ransom as we can't just fire all the workers because we still have so much work to be done. We're also (cynically) aware that "Thank You" lunches might be fun at the time, but don't seem to help foster loyalty or appreciation. In our most cynical moments it feels like sabotage ‑‑ the longer it takes to launch Ocelot, the longer the guys get to work. To balance the scales, Sue's been feeling poorly for days, and so maybe came on too strong in the morning about the humidity and the teak, and then asking for a different distribution of workers. And maybe Baw felt on the spot and lost face. Hello Asia. Maybe everyone is just more anxious now that we're all taking about launching in December. Sue certainly feels the self‑imposed tension, which is not as much fun as a more carefree, go‑with‑the‑flow feeling. And definitely for the men there has to be a lot of anxiety about loss of work once Ocelot launches as many of these guys live hand to mouth. Whatever it is, we need to work through it. Last night the "plan du jour" was to arrive early at the yard and dismiss (for the day) those workers who walked out yesterday, but let the others carry on working. We were also going to spend some time talking with Baw about what was going on. None of that happened. Lek never showed (still not sure why) and Heru and Yando looked sheepish when they arrived. Sue told Heru (who speaks some English) that we were not happy and that we want to know if men have to leave after half a day. That they are to tell us, not Baw, because we are the ones who pay the money. He agreed. We said, "Don't do that again." That was that. Baw, Heru and Chambron (who was not at the yard at all yesterday) began preparing the floorboards for their edge epoxy and bottom epoxy. That means sanding back the edges enough so that the new epoxy doesn't make the boards too big to fit in their jigsaw patterns. Before lunch they got all of the (almost 40) floorboards epoxied on their undersides. We didn't have any interaction with Baw until Cris (yard manager) arrived with our list of things for Baw and the men to do, translated into Thai. Baw seemed amenable to all our list of projects, and he and Cris threw around some Thai words for things like fo'c's'le (which turns out to be "hong" or "room"). Cris was still learning that the English word "head" means bathroom on a boat. So he countered by saying that the toilets (like the squatties in front of Ocelot) are "hong nam" or "water room". 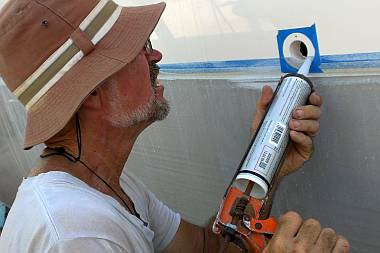 Pla and Ben were the gelcoat team, taking turns working with the big machine polisher to give Ocelot a gorgeous shine on the aft‑aft deck and the outer sides of the targa bar. At our request they also covered both sugar‑scoops with vinyl so the shiny surfaces will be preserved. 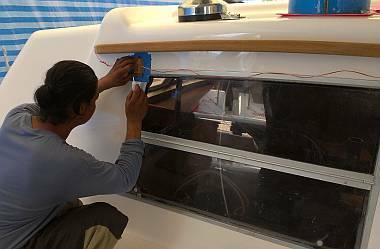 Sue worked up on port deck with the drill and fiber wheel and Silicone Off liquid to make some head‑way on the window frame. It's okay to make a big mess with that stuff while the guys are sanding in the salon, but once they start to clean up, she has to stop and clean up all the silicone bits so they don't blow in on the wet varnish. 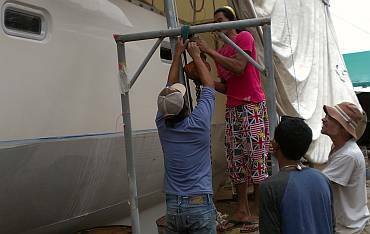 Jon and Sue spent much of the morning getting the bimini supported near the front corners, but inboard of them so that when Mike and the AME metal‑workers come to design the legs it would all be ready. According to our drawings (done by Amanda) we wanted the front corners to be about 27" (69cm) off the cabin‑top, which was to give us head room when standing on the step outside the galley window. But when we tried it today, the bimini was still a bit too low so we scavenged around the boat yard for blocks and bits of rubber to support the bimini a bit higher. Eventually we settled on a cabin‑top to bimini corner height of about 28" (71cm) which gives us head clearance, but doesn't look too high. We had no sooner finished this project than Mike called to say he and the AME metal‑workers would be coming about 2pm. After lunch Heru, Chambron and Baw worked in the salon to get some big spaces ready for polyurethane. 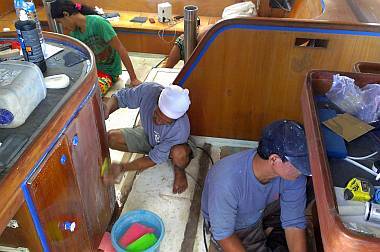 They cleaned the shelves, then realized that Lek hadn't finished sanding the epoxy locker doors and panels on the peninsula, so they attacked them with wet/dry sandpaper. It's amazing what 3 good workers can accomplish in a short time. Soon the salon was filled with the distinctive solvent odor of 2‑part clear polyurethane. Baw was the brush‑master, using foam brushes of 2 different widths to apply this first coat of thinned TOA polyurethane to the salon shelves. Then he continued on to the area under the nav‑desk and finally the galley peninsula panels. Cool! First coat of 3. Houa was having fun re‑inventing the hanging locker shelves. Several of our hanging lockers were converted to shelves in (of all unlikely places) The Galapagos, Ecuador. 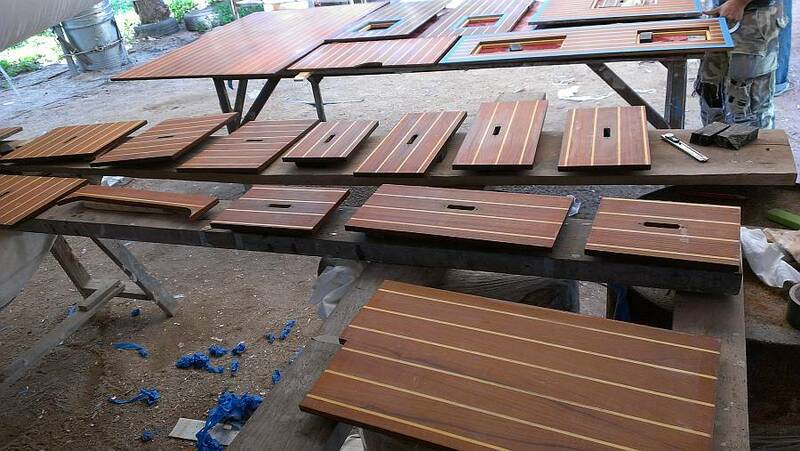 The local woodworkers claimed the wood was "Galapagos teak" but who knows what that means. The wood is quite pretty and has actually held up pretty well, except for the outside shelves they put in over our forward salon port‑lights (which have now been rebuilt in foam‑sandwich). But they took several shortcuts, like attaching the shelf ends (fiddles) with some sort of cheap glue, not epoxy, and the side brackets on the locker walls that hold the shelves up were way too small (about 1/4" or 6mm). So Houa's re‑making all of that and he will also reinforce some of the larger shelves with stringers across their bottoms. Bo finished cleaning the salon locker, then asked for more work. Sue was about to lead her to the storeroom to scrub up some things around there when she remembered the battery compartment. We want to put (Thai white) gelcoat in there but it needs cleaning first. So Bo got to spend the afternoon in the battery box, but downwind of the cockpit fan. Jon got 3 more of our waterline vents installed. These go in pretty easily. 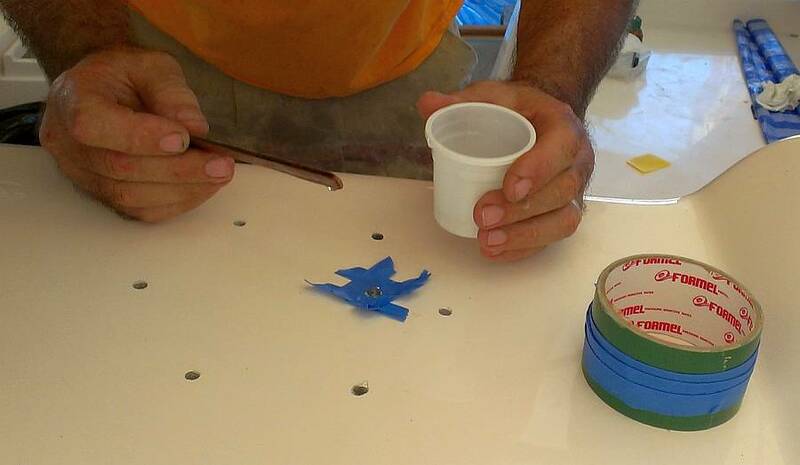 The holes are cleaned out and wiped with acetone, the mounting holes are drilled and the area is masked with blue tape. Silicone is put on both the hull and the stainless steel vents, they are screwed into place, and the excess silicone is pulled off with the blue tape. But some of our vents need repairs, which wasn't detected until Jon took a close look at them. When Mike and the AME guys rolled up, Jon and Mike had fun playing with various design ideas for the 2 forward legs. 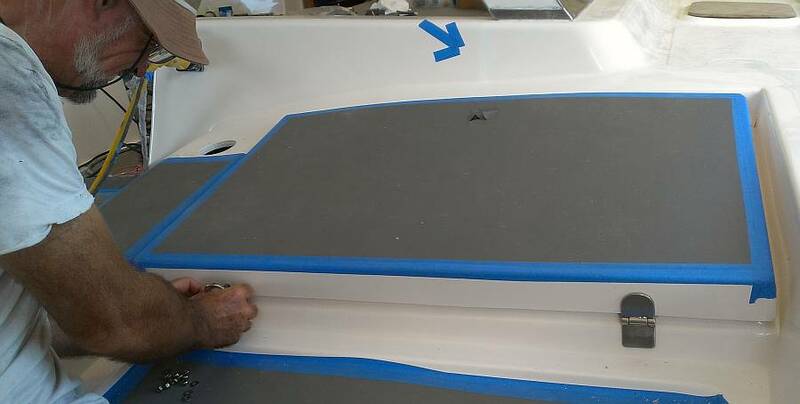 The legs will be 2.4" diameter by 1/8" wall (61mm x 3mm) stainless steel tubing, with a custom top to fit the corner of the bimini and a custom bottom to fit a ridge on the cabin‑top, both done in 4mm (3/16") stainless steel plate. The legs have to hold the bimini up when people are standing on it, but they also have to provide fore/aft strength to the targa‑bar in case the dinghy gets filled by a breaking wave (which is rare but happened to us off the top of Columbia in 2003). Since the bimini is also a rain‑catch, we want the legs to carry the water down to the deck, which should minimize the usual ugly hoses dangling down from biminis that we see. Once we designed it (on the back of a bit of plywood) the AME metalworkers started making patterns out of future‑board (plastic cardboard) and PVC pipe. They finished port side, but need to return tomorrow to make the templates for starboard. Mike feels that they should have something ready to test in a few days, and he's hoping that the finished legs will be ready by the end of the week so they can be sent to Bangkok with the rest of our new stainless steel to be electro‑polished. Another day at the Ocelot Circus with a whirlwind of things going on. High white clouds streaming by, then dark ones threatening rain, but nary a drop, thank goodness. The Center Ring of the circus today focused on Baw, Heru, Chambron and Ben, who finished getting all the 40+ floorboards ready for their 3 coats of gloss polyurethane varnish. 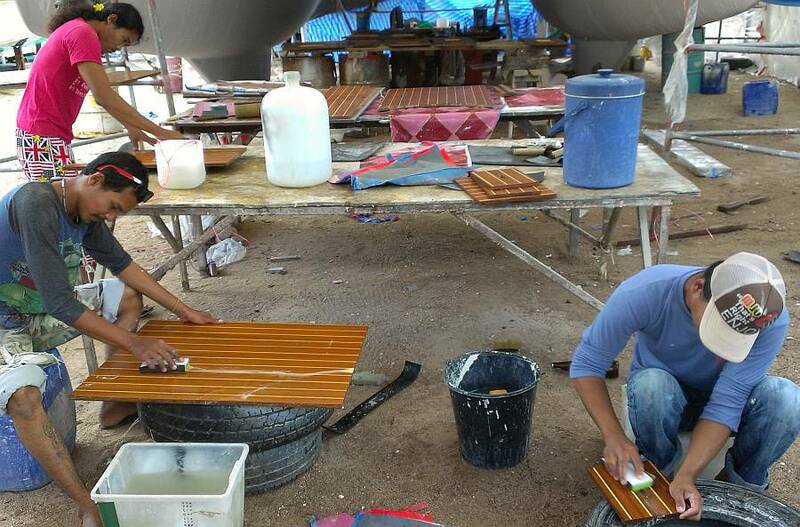 Most of the sanding had already happened, so this morning it was time to organize the boards, find places for them before and after the spray, wipe them down, finish the spray‑tent in front of Ocelot, and get them sprayed. Baw did a 3‑coats‑in‑one, in that he sprayed a coat on as many boards as he could fit in his spray area, waited 10 minutes, sprayed a second coat, waited 10 minutes, and sprayed the third coat. This is apparently the equivalent of doing a wet‑on‑wet job with epoxy, but waiting for the polyurethane solvents to evaporate between coats. Bow got all the floorboards done in 3 batches, the first being sprayed mid‑morning, and the last set being finished at about 4pm. They look gorgeous! But, unfortunately, we will not be keeping the shiny gloss look, as we don't want slippery‑when‑wet floorboards on an ocean‑going cruising boat! Weather permitting (and if they get sanded in time) we'll be spraying them with a final top coat of Epiphanes Clear Satin Polyurethane in the next couple days. Off on a side show, Yando and Chambron (when not doing floorboards) worked inside the side spray tent, shirts off, sweat pouring. The men had wrapped up the (finished) boom, and then swapped in the forebeam. The plan is to give the forebeam a second coat of International Interthane 990 top coat like we did for the boom, repairing 2 places in the process. The forebeam was the focus of Jon and Sue's day, but in a more mathematical way. First Jon had to mount the 2 forebeam end‑brackets, that go between the forebeam and the bows. This involved some hot and sweaty time drilling the 8 mounting holes up in the very fronts of the fo'c's'les. The holes had been covered over on the outside, but they were still visible on the inside. We could try to force the beam back into its original position by pushing the bows apart, but those bows are pretty strong and we're not sure we could. We're not even sure we want to, as that would distort Ocelot's shape - probably not significantly, but we don't know. And the application of the necessary force would probably wreak havoc on the gelcoat. We could create a new mounting location for the forebeam, further forward on the bows where the natural curve of the bows moves them further apart. 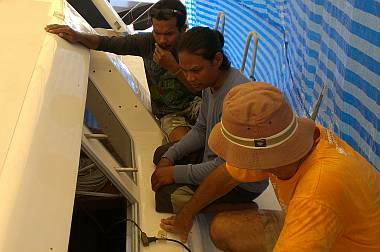 Some measurements and geometry on the bows revealed that we'd have to move the forebeam forward about ¾" (19mm). Somewhat surprisingly, the forebeam reinforcement points inside the bows would actually allow this, as they extend at least 1" (25mm) further forward than necessary. But this creates other problems, as the anchor‑platform that goes between the trampolines would now be too short. It's possible (probable) that extra fiberglass has moved the mounting location for the anchor‑platform bracket forward, probably by about ¼" (6mm) but that still means that the anchor‑platform would be about ½" (12mm) too short. We could possibly enlarge the anchor‑platform mounting holes by ¼" (6mm) at each end, but that's 8 holes through thick aluminum plate. Sue did some supervising of Bo and her cleaning, moving her from the final clean‑up of the battery compartment to a funny little job. Our emergency parachute anchor has languished for 12 years in a plastic container in the chain locker, which is good, because it means we never had horrific‑enough seas to need it. But it's bad, because it means it was never touched, never opened, never cleaned. So Bo got to do the exterior scrub on the stiff plastic satchel.. We chose not to have her pull anything out of the bag. That's for us to do up on deck one day, and hopefully never under duress. Anyway, that done, we were truly out of "clean‑up" jobs for Bo, so we thanked her, paid her 3.5 days and sent her off. The men from AME were back on board today, fitting the templates for the bimini legs. Once they were done, Jon asked them to leave both blue pipes and future‑board brackets in place so we could take pictures. A round‑robin view showed that the two legs are pretty darn parallel, at least close enough as makes no difference. We think they'll look just fine from the cockpit, which is where they'll be the most noticeable. Inside the salon we had Pla, Lek (yes, he was finally back) and Ben sanding yesterday's polyurethane, getting ready for the next coat. By mid‑afternoon everything was sanded, cleaned, wiped, and ready to go. Lek worked with the wide brush on the wide shelves, while Ben applied gloss polyurethane to the galley teak and all the places under the nav‑desk. Houa, being downwind of the spray area, had to time his work in and around Baw's polyurethane spraying. He did get the Galapagos hanging locker shelves all sanded and the reinforcing strips epoxied to their bottoms. We found him late in the day, up in the boat, snuggled into the hanging locker checking the fit of the shelves and their new brackets. We would not have thought it was possible to sit inside the hanging locker! Houa also gets called off his main jobs to do other small carpentry things for us. 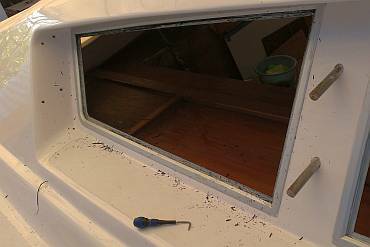 We asked him to cut out a tiny backing plate for the galley window hatch (because it was on our minds, as we were working with AME outside the galley window!). We also needed his ideas on what to do about a corner of veneer peeling up on one of the passageway teak and holly floorboards. 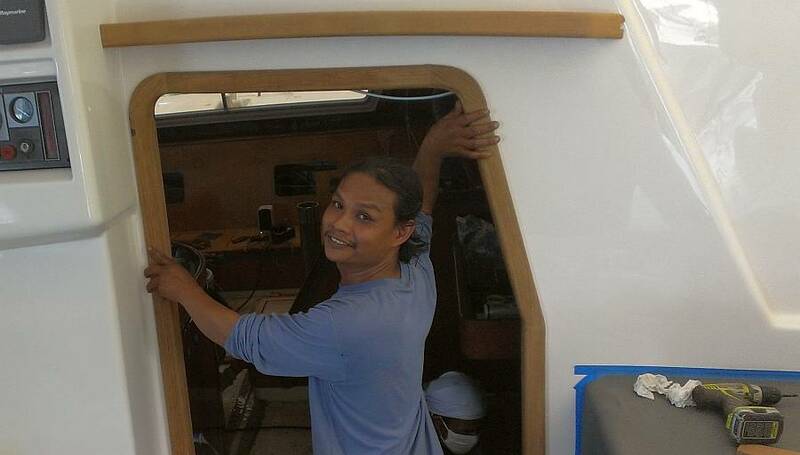 His 2 ideas were to take back the veneer and put a new strip on, or to cut the angled edge and fit a piece of teak along the hull so it intersected at 90° instead of obliquely. Jon suggested the "it's good enough and no one will ever see it" option: glue it down with epoxy resin, clamp it up, and get it sprayed with polyurethane along with the other floorboards. So be it. We had a long chat with the yard manager, Cris, about our workers and what might be going on. There has been no evidence from Baw that anything was wrong. The most we got was yesterday, with Heru and Yando looking sheepish. Today there was respectful give and take, communication, teasing, smiles amongst all of us, Baw included. To an outsider we probably all looked like a happy boatyard situation. But we are still at a loss as to what happened and why. Cris's take on this is that there are some workers mature enough to handle things and some not, and Baw is only 26. Apparently when Baw was upset he then vented to the rest of the team, and some of them took it to heart and walked out (more credit to Pla, one of our older workers, for staying on and working). Cris just shook his head and said, "The bottom line is that this attitude shows that some men just don't care." Don't care about what? Us? Or Ocelot? "They just don't care about you or their jobs, or they wouldn't do this." Well, yeah. So that's why we've been trying to help Baw and Houa build their careers by helping them buy tools, by talking about maybe setting up websites for them to advertise their work, and things like that. We also thought that our men had pride in the work they do (and we still believe this is true). So we asked Cris what it takes to get the men to care. Now there 's a loaded question. We thought our men did care. We know some of them chose to work on Ocelot, or to stay through the hard times. We have tried to always be respectful of their opinions and expertise, deferring to their knowledge when we don't have enough. But maybe this is all backwards, and this is Western thinking in an Asian world. Anyway, Cris suggested we talk to Baw (through him as a straight interpreter) out on the beach at lunchtime tomorrow. Cris said that Baw probably does not understand what we can offer him in terms of exposure to other cruisers, or references, and that his perspective is just that this is another of hundreds of jobs in his life. Cris said the men like to get recognition for boats finished, as in a sort of certificate that says "I worked on Ocelot." OK, we can do that. But the stream flows both ways: we treat him well, and he has to treat us well. Reading between the lines, it seems that we have missed out on getting the respect of our workers, and Cris was hesitant to repeat the gossip of the guys, for fear of hurting our feelings. Now our curiosity is up. How does one win the respect of Thai workers? What have we been doing wrong? Can we change anything? Will we really be able to get there, and do we want to? A beautifully warm and breezy day, with things happening all over the boat, but it felt a bit scattered. As a follow‑up to yesterday's discussion with Cris, we planned to have a meeting with Baw on the beach at lunchtime. Cris offered to be there strictly as translator, which was great. Baw and Cris have a business relationship which got off to a rocky start but which has apparently gotten better lately. We very much wanted Baw to understand us but we didn't want to appear to all be ganging up on Baw. This meeting weighed heavily on us, as we tried to figure out what we really wanted to say, and wondering if it was going to end up on a good or bad note. Sue tried to write up a list of the points to make last night, but gave up. This morning it was a 20‑minute no‑brainer. It was all just so obvious. Sue emailed Cris the list, and made a copy for ourselves, and also made and printed a quickie version of a Letter of Recommendation. We decided early in the day that we had to ask Baw to not paint the forebeam, and we were concerned whether he would understand. Sue approached the subject as soon as Baw arrived, and he seemed to understand pretty well. When we raise the forebeam to check its position, we may hurt the paint. So the first job is to finish the polyurethane spraying so we can move the metal scaffolding (which is now part of the spray‑tent) so we can raise the forebeam. He got it. But he didn't pull the men off the forebeam sanding job until late morning. So once again we had Chambron and Yando stripped to the waist, wet sanding the forebeam inside the spray tent. Baw, Heru and Ben sanded the shiny floorboards to get them ready for their 2‑coats‑in‑one satin spray. This was pretty much an all-morning job. Pla and Lek worked together in the salon getting it ready for another polyurethane coat on all the surfaces. Sue took advantage of the dusty/watery mess inside to make her own mess. She worked 2 hours on the second port window that's out. With tiny screwdriver‑size scrapers, a fiber wheel on the drill, rags, fingernails, Silicone Off, and elbow grease, she got the second frame all cleaned and ready for the window. Houa, Baw and Jon got together to discuss just how it was going to be done. Houa will create a wooden frame to go over the window once it's pressed into place with silicone, then he'll tap small wedges in place to further press it in. Sounds like he's done this a lot, as he was very sure of the process. 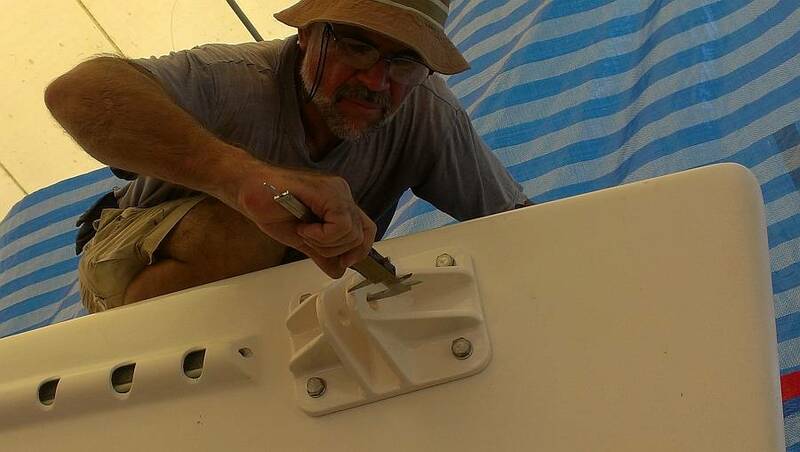 Jon started mounting the anchor‑platform bracket up on the foredeck. This goes between the deck (just in front of the anchor‑winch) and the anchor‑platform (which goes between the trampolines and goes all the way to the middle of the forebeam). The bracket mounts with 12 bolts: 4 on top, 4 on the front, and 4 on the diagonal. He located and drilled the 4 diagonal holes, then did a preliminary mounting. 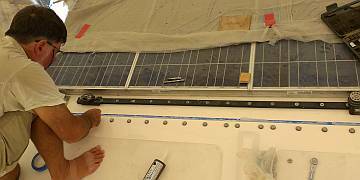 About then he had a light bulb go off: we're concerned that moving the forebeam forward 3/4" (18mm) will mean that the anchor‑platform will be too short to reach the bracket Jon was mounting. But we can space the bracket out by the same amount as the forebeam, and then everything should fit correctly. Houa could probably create us a custom teak pad to go between the (curved) bow and the anchor‑platform bracket that would look beautiful (if Jon made it, it would look ... agricultural). Noon came, we ate a fast lunch, and greeted Cris and Baw at our beach picnic spot. In keeping with the psychology of "people listen better to criticism is you start with compliments" we began by listing the ways we appreciate and value Baw and his work. Then we laid out the things we expect of Baw as our team leader: that he does his best, communicates with us if he doesn't understand something, inform us if he's going to miss work, lets us know if there's a problem with another worker, and to realize that we value his expertise and experience, but that sometimes we will disagree and that's OK. We still respect him, but he has to accept that sometimes we'll want to do things differently from how he would, and since we're the employers we get the final say. Then we laid out things we are NOT willing to do, as employers; starting with no advances (the requests have gotten a bit overwhelming), we won't tolerate bad-mouthing of us or Ocelot, or a general inciting to walk off the job. We explained that we understand folks have bad days and good days, and if the day isn't working it's OK for someone to leave, but not OK to encourage others to leave as well. We won't always do things Baw's way, and he may just have to go along with our decision (he is encouraged to ask why and have a discussion, but the final decision is ours). Part of the problem here is that Thai schools do not encourage questions or even discussion, so they don't know that we can still value and respect someone while disagreeing with them. They tend to see any disagreement as a loss of face, especially if it's done in a public (workplace) setting. We tried to tell him that we'll always respect him, but we might still disagree, and that's OK. It's a difficult set of concepts to explain, but Cris spent a lot of time trying, stopping us every sentence or 2 to translate for Baw, and the translations always took longer than our English. Then we told Baw the things we are willing to do for him (and the good workers on the team). We offer to be fair and help ease communication (at this point Cris offered his services as well). We will (and are) helping front money for Baw (and Houa) to buy equipment like spray guns, compressor, and other equipment for their careers. We will give Baw (and other workers) a Certificate of Completion, saying he was the team leader on Ocelot's refit. We will give him an English and Thai letter of recommendation when Ocelot finishes, which he can use for future employment. Since Baw (and the other workers) are concerned about employment after Ocelot is finished, we offered to spread the word about his good work and skills to others via our website and by word of mouth, and event to create Baw his own website if he'd like (one problem here is that at 26, Baw's young enough that he's not quite sure what direction he'd like to push his career). By early afternoon Baw had set up for the first batch of satin polyurethane spray, but he didn't like the results. The coating was not smooth and flowing. He blamed it on the old spray thinner, and maybe on the old 2‑part Epiphanes polyurethane. Not surprising. We've had those cans around for at least 2 years. He tossed them, and Sue scootered out to get more. But Top (our local chandlery) had not re‑stocked from their parent store in town, so Jon did the 1 hour round trip to town, and brought back more polyurethane and spray‑thinner. Baw got about 80% of the floorboards sprayed, and those are now finished! Up in the boat it was awash with sponges and sandpaper and people. Pla and Lek sanded the nav‑area and the peninsula. 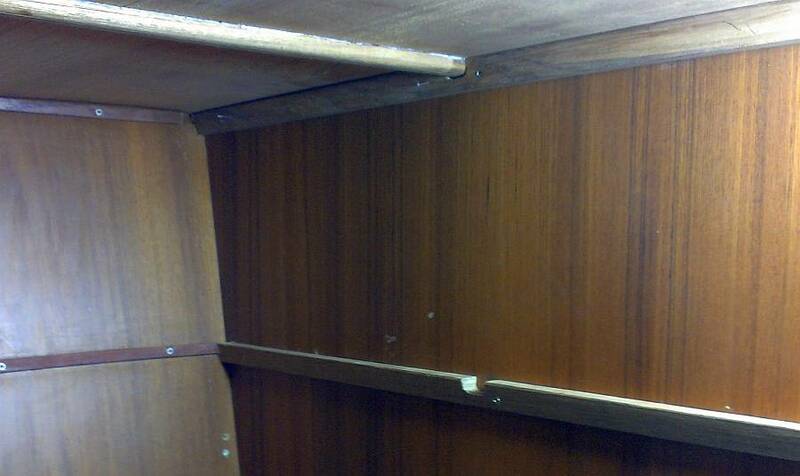 Chambron and Yando were hunched over sanding the gelcoat strip under the bench seat, just above the floor. This previously white strip has turned yellow over the years. By sanding it we hope to end up with a clean, if not shining surface. Houa was in the melee as well, but mostly spending time in the hanging locker. He got all the support stringers mounted, and the shelves themselves fitted. Instead of tacking the shelves to their supports, he cut a groove into the supports which exactly fits the reinforcing strips he put under each shelf. This allows the shelves to notch securely into position and prevents them from sliding forward out of the locker. Clever! Houa and Sue discussed the salon floor supports, which need to be replaced and which need to be epoxied before the neoprene gets stuck to their tops. At the last minute Baw commandeered Lek and the two of them wiped down the shelves in the salon and at 5pm were seen brushing on yet another coat of gloss polyurethane. We think this is #3, and the final coat of gloss. Baw says he will spray the satin top coat, which should involve some interesting masking. It was a scattered afternoon for Jon, what with the mad dash to town and back. We looked at mounting some of the cockpit seat hardware and discussed the big upcoming project of assembling and mounting deck hatches. But all of this must wait for tomorrow, when we can get a fresh (hopefully emotion‑free) start on the day. Wow. Another week gone by. Way too fast. Way too much confusion. Today was a dance of sideways steps and mini‑steps forwards and backwards. Pla, Lek, Chambron and Yando basically lived in the salon all day. Chambron and Yando were again down on the floor sanding the white gelcoat strip under the seats. This is a pet project of Sue's because apparently only she can see how the old gelcoat has yellowed and stained. By letting 2 guys spend a couple days on it, we are going to have a spiffier‑looking salon. Maybe the floorboards will even fit better now! Lek and Pla were sanding the polyurethane coats up on the shelves and on the vertical panels on the peninsula and nav‑station. The actual application of the next coat of polyurethane happened in the late afternoon so we'll be ready to move forward again on Monday morning. 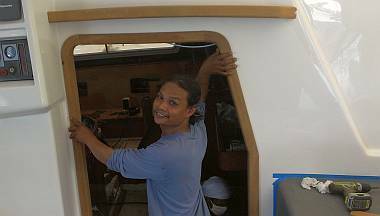 Houa spent the morning working on projects for our Swiss friends and in the afternoon checked the positioning of the eyebrow over the companionway door. He'd moved it so it follows the same curve as the entryway door‑frame, as well as the curve of the cabin‑top. Jon and Sue approved it, so Houa and Lek worked on taping the area and the eyebrow itself. 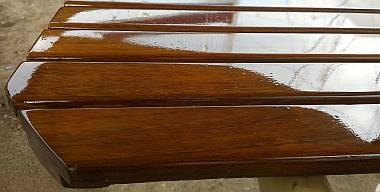 Houa sanded the gelcoat, primed it and the teak, and then gunned on Sika 298, the brown stuff he used for setting down the teak deck. Baw had a frustrating day with his polyurethane spraying. First set‑back was on the shopping side of things ‑‑ he went out to get us a couple big gallons of TOA 2‑part Gloss (interior/exterior) polyurethane, and found out that TOA has stopped making it, and all the local stores are out. That means we have to move either to very expensive marine 2K or use the next local product, Beger, at about 40% higher price. We need an exterior grade product for the UV protection. The interior grade products will definitely breakdown sooner in our environment, and anywhere we get direct sunlight in though hatches. And this stuff is going over epoxy which will definitely break down without UV protection. The bigger frustration came when starting to spray the new Epifanes 2‑part satin polyurethane. This stuff is supposed to be the cat's meow of interior 2‑part varnishes, but Baw was getting many little bubbles on the surface of the spray. He ended up spraying a bit and taking it off 3 times! Finally we called the supplier, Top, and were very pleased that Top himself came to the boat yard. Unfortunately, despite a lot of chit chat with Baw, it appeared that Top couldn't really help, except to say that maybe we had too high a percentage of thinners. Baw was using up to 40% thinners on yesterday's spray, which came out great. Top quoted the Data Sheet as indicating 10% was max. Baw tried 20% and it didn't spray well from his gun, and ended up with a very heavy orange peel look. He moved up to 30% and we still had craters of the moon look. To everyone's credit we all kept our cool, but it was very frustrating. 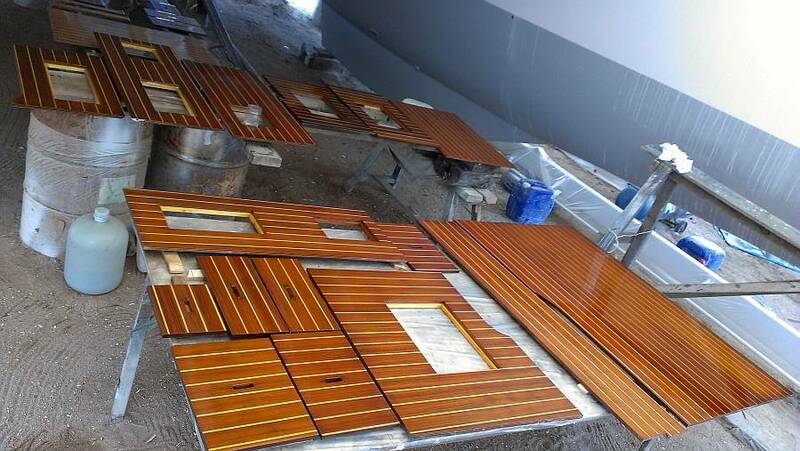 The pieces Baw was trying to spray were, luckily, the grated floors for the galley and heads, not the big teak and holly smooth floorboards. Finally, in a fairly atypical "what the heck" attitude, we decided to have Baw spray the bubbly polyurethane and let the bubbles appear where they would. We all laughed at the result, basically saying maybe it would work as a slight nonskid on the galley and head floors, which would be a good thing. But Grrrrr. The Epifanes website talks about getting many bubbles on wood that is warming. Our afternoon temperatures in Phuket are pretty steady, and we were in the shade, not hot sun. Basically same conditions as yesterday and the same time of day. Only the Epiphanes is different. Jon scootered back to yesterday's aluminum sliding door folks only to learn that they don't have the gasket materials we need. So he ventured up the road towards Phuket town to a huge aluminum and window place. We thought they just sold materials (like 50m rolls of gasket material) but the owner said that they do repairs as well. So Jon left the 2 parts of the door that we want repaired, intending to pick them up at 2pm. But we had visitors to Ocelot, friends and strangers both, and Jon never got back. Now it's first on the list for Monday morning so that Houa can move to that project. 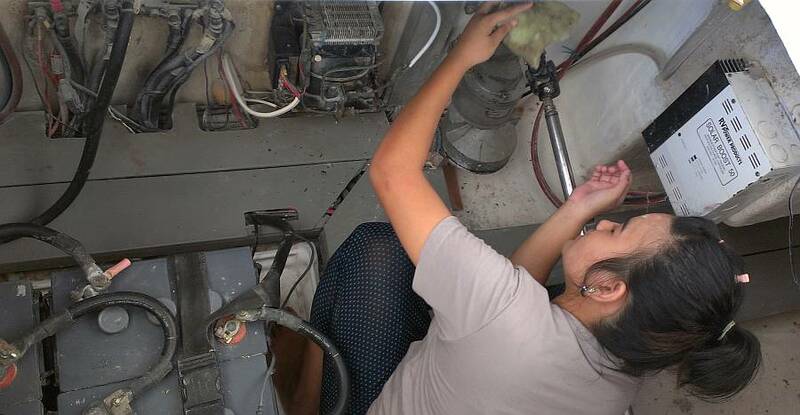 Early in the day Jon decided to jump down into the engine rooms and retrieve the water valves in the sides of the sail drives in order to find replacements. Well, first he had to lift off the heavy engine hatches and put them somewhere, which made him realize that we could actually mount the hinges on the darn things and have easier access! So Sue grabbed the engine hatch accessories from the storeroom. Despite visitors, lunch, polyurethane consultations, and errands, Jon did manage to get the hinges and bracing rope (the line that holds the hatch open and prevents it from folding down and aft onto the steps) on starboard side. He was part way into the project on port when it was quitting time. Never did get to those valves. Guess we'll do it Monday. Our Swiss friend Pierre had some interesting ideas about our forebeam placement dilemma. He suggested that instead of moving the forebeam forward (i.e. to where the hulls diverge enough to fit it in) we could machine out the big 3/4" (20mm) mounting holes on the ends of the forebeam (and the end brackets). By machining larger but slightly offset holes, we would effectively shorten the forebeam enough to let it fit where it's supposed to, while still keeping the holes round (we wouldn't be elongating the holes, we'd re‑drill them larger and slightly offset, effectively moving them slightly). It would require going to huge 24mm bolts (which might be difficult to find) but it keeps everything else where it is. The machining would have to be done on a milling machine by someone who knows what they're doing (and why) which would mean transporting the forebeam all the way to LCK engineering in town, but their truck has already carried the forebeam in for other work. The brackets, even though they're small, would be tricky in that they are made up of tangs at oblique angles, not right angles, so getting everything lined up could be tricky. But first we need to put the forebeam up in place and see what we're dealing with. Well, now we have a couple options worth thinking about. And what better time than over our (1‑day) weekend? Sounds good to us!